The 2019 Museum After Hours is in place. This summer we have a super line-up of topics and speakers, covering everything from folk-music to bats. Other topics to be covered include The Royal Muskoka Hotel, Attawapiskat, Prime Ministers and more. Attendees are also able to browse the museum while enjoy complimentary lemonade/tea and homemade cookies. July 24th – local musician Bev Robertson will be sharing, (and singing) about folk music. August 14th – no ‘Museum After Hours’ as the museum gets ready for their annual ArtiFact or Fiction event Aug 15th. 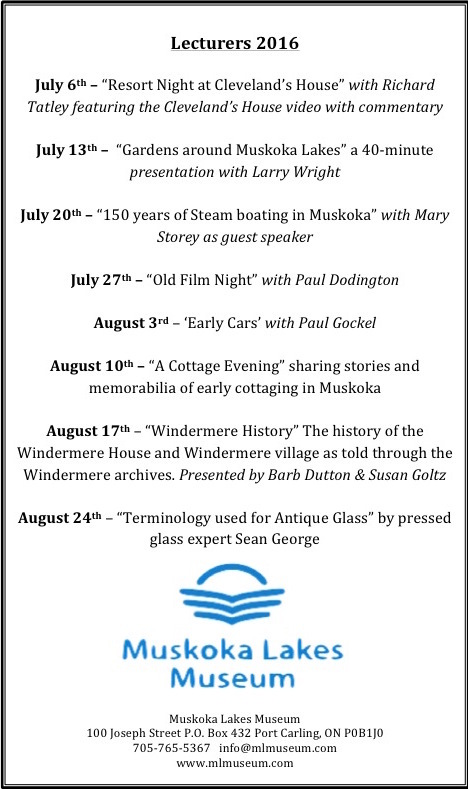 August 21st – Dr. Geoffrey Shifflet will share his research on the Royal Muskoka Hotel. August 28th – outdoor enthusiast and local resident Rudy Hrdlicka will share from his latest adventure travels.